You've probably heard the term War Czar used in the news recently. This is a slang name for a position the Bush administration has created to oversee the wars in Iraq and Afghanistan with authority to issue directions to the Pentagon, the State Department and other agencies. 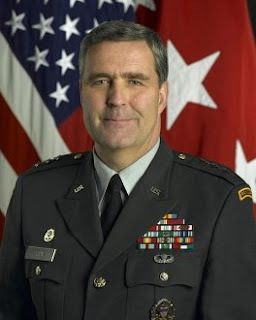 President Bush has chosen US Army Lt. Gen. Douglas Lute, the Pentagon's director of operations J-3, to oversee the fighting in Iraq and Afghanistan as a war czar after a long search for new leadership. In the newly created position, Lute will serve as an assistant to the president and national security adviser, and would also maintain his military status and rank as a three-star general. Creation of the new job comes as the administration tries to use a combat troop buildup in Iraq to bring a degree of calm so political reconciliation can take hold. The White House has sought a war coordinator to eliminate conflicts among the Pentagon, the State Department and other agencies — and to speak for the president at times. General Lute, a West Point graduate became director of operations for the JCOS in September. Before that, he served as director of operations at CENTCOM, during which he oversaw combat operations in Iraq and Afghanistan, along with other regions. General Lute's title will be Assistant to the President and Deputy National Security Adviser for Iraq and Afghanistan Policy and Implementation. He will report directly to President Bush as well as National Security Advisor Stephen J. Hadley. His position is considered to be an assistant to the President. He also has the authority to issue inter-agency directions, an authority the civilian equivalent predecessor did not have. Poor guy. The War Czar exists solely to take the blame for all bad strategic decisions, past present and future. Wait a year and watch the poor guy testifying before congress explaining how he took a mopping up operation (following Bush's successful surge policy) and turned it into a counter insurgency/civil war hell. ...Oh wait, I see what you mean.